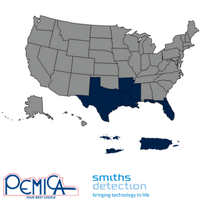 2016 was the year when Pemica Inc. jumped onto the “major leagues”, after the Florida Department of Corrections (FDO) trusted us to provide almost 200 X-ray scanners for 59 correctional facilities. Nowadays, after some expecting months and hard work of our amazing team, we can assure our consolidation in the American market due to an exclusive contract with Smiths Detection which allows us reach to six new territories besides Florida. They are Arkansas, Mississippi, Louisiana, Puerto Rico and the American Virgin Islands. This is a path we have already begun to walk. Our team has made several trips in order to identify potential customers. Elvis says that one of our main advantages is to know what doors we’re going to knock at, “Thanks to the knowledge we got from the continuous recognizing trips we’ve made to those new territories. So, from now on, everything is a matter of reaching to as many clients as we can to show them the quality of our services and products”. Together with expansion, comes along the need for making our services faster and more efficient. The person in charge of this crucial job is no other than Alejandro Maita, who coordinates the technical service in the North of Florida and has a high expertise in the zone. Besides, he is in charge of training courses and coaching in handling x-ray scanners at correctional institutions. He says, “When I see everything we have attained, I feel proud to belong to this great company and make my contribution for the business to go ahead”. Actually, we all consider this expansion as a step forward in growth with great optimism and we, as a team, are fully prepared to assume whatever challenge comes upon us when required. This opportunity is, without any doubt, our chance to outstand as far better than before.